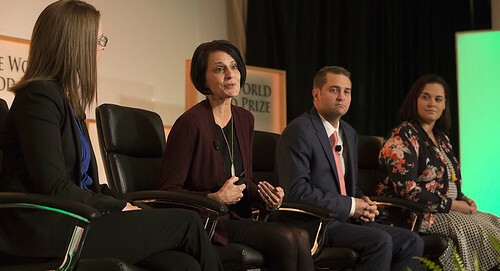 The World Food Prize created the Iowa Hunger Summit in 2006 with former governors Robert D. Ray, Terry E. Branstad, and Tom Vilsack serving as honorary co-chairs. The first Hunger Summit took place in 2007 where they were joined by new Iowa Governor Chet Culver in honoring Nobel Peace Prize Laureate and World Food Prize Founder Dr. Norman E. Borlaug. The Iowa Hunger Summit gathers leaders from across Iowa representing community organizations, business and industry, state and local government, social agencies, churches and religious communities, schools and universities, civic and social clubs, and other individuals and groups that lead or participate in projects to confront hunger. The annual Iowa Hunger Summit is attended by between 500 to 700 hunger fighters from across the state. The Iowa Hunger Summit is free and open to the public. All participants must register for the event and present their ticket at the door. Interested in what happened at the 2018 Hunger Summit? Watch the 2018 Iowa Hunger Summit here! At the first Iowa Hunger Summit, Governor Chet Culver presented Norman E. Borlaug with a proclamation declaring October 16 as Norman E. Borlaug/World Food Prize Day in Iowa. Joining were former Governors Robert Ray, Tom Vilsack and Terry Branstad. Hundreds of participants attend the Hunger Summit from across Iowa and the United States.